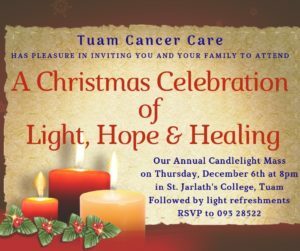 Tuam Cancer Care would like to invite you to their Annual Christmas Celebration of Light, Hope and Healing, which takes place on Thursday 6th December at 8pm, in St Jarlath’s College, Tuam. We cannot guarantee that people who received personal invitations by post in the past will do so this year. This is due to changes in Data Protection Legislation. We hope that those people can still join us for this special evening. 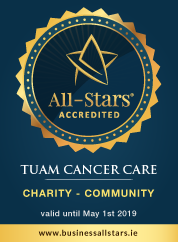 RSVP to 093 28522.